Luxury student apartment opposite the University of Plymouth with outstanding views of the reservoir and University grounds. This stylish, 2 bedroom contemporary apartment is situated on the third floor of a beautiful character property. It boasts an incredibly spacious open plan living area, containing a dining table with 4 chairs, a comfortable sofa and carpeting. The property has good sized bedrooms with built in wardrobes and desks. The modern and bright kitchen is equipped with a range of units including a washer dryer, fridge freezer and cooker. And the fitted bathroom offers a shower with LED lit shelf, WC and wash hand basin. 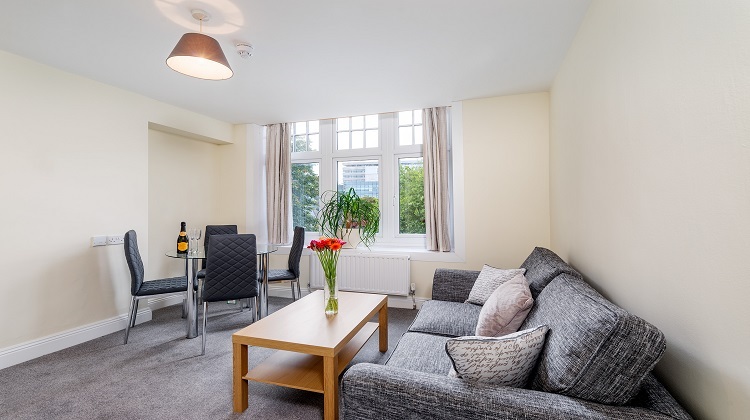 With the addition of hard wired Virgin Voom fibre internet connection, and soundproofing throughout, we really have thought of everything to make your apartment a real ‘home from home’. Our student flats are less than 250 metres from Plymouth University. Room prices include gas, electric, water (up to a usage cap of £10 per person / week). We don’t ask for deposits, admin fees or guarantors, and offer individual tenancy agreements. Because we own and manage all our student apartments, we have a keen interest in maintaining them to a decent standard – as such our maintenance service is without parallel! (NB: Please note that the decorative items such as cushions, laptops, TV’s etc shown in the CGI floor plan/ photos are for illustrative purposes only and do not necessarily come with the apartment. If in any doubt, please do ask). Stunning contemporary apartment opposite The University of Plymouth with campus and reservoir views. Set in beautiful period property. No deposit, guarantor or admin fees to pay. Free fast speed broadband and utilities included. Are you making this enquiry on behalf of a group of people? Would you or your group mind sharing a property with other tenants if necessary? Please be aware that we are open from Monday - Friday, 10am - 4pm to conduct viewings (NOT AT THE WEEKENDS). We need to give our current students at least 24- 48 hours notice of a viewing so please consider this when selecting an ideal date and time for your viewing. The date and time you are requesting is purely provisional at this stage, following your request, Student Rooms 4 U will come back to you via phone or email to either confirm the date and time of the viewing or suggest possible alternative arrangements. If your interested in any of our other properties please select them below. We will now be offering a 48 week contract for all of our house shares for the 2019/ 2020 year. (With the exception of 5 Marlborough Rd, where the contract is for 46 weeks). For our apartments (including 56 North St), tenants have the choice of a 48 or 50 week contract. Please note that all tenants living in the same apartment, must have the same length contract. 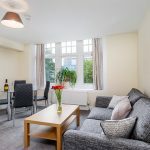 To secure your booking for the 2019/ 2020 year we will require a £250 Non Refundable Reservation Fee (so please be aware that if you do drop out of the booking before your rent is due in August 2019, Student Rooms 4 U will retain the £250). When you pay your first terms rent in August 2019, the £250 will act as a contribution to your Term 1’s rent, so you will pay the amount due for Term 1, minus the £250 already paid. Please be aware that we will also carry on showing other students the property you are interested in until all members of your group have paid the Reservation Fee with cleared funds (cash/ card). Once you have paid your £250 Reservation Fee and filled out a booking form, a contract will be sent to you in due course (usually by email). You will need to print out the contract if it has been emailed, sign it and return it to Student Rooms 4 U within 7 days of having received it. You will also need to be able to comply with the ‘Right to Rent’ legislation as set out in this downloadable guide, prior to being able to occupy your property. Please note: We want you to enjoy your stay with us and be happy in your living environment. We have discovered through experience that groups who already know each other before moving in generally have a more harmonious living experience than those who don’t. Therefore we tend to give group bookings a higher priority than individual room requests. This property has permit parking available or parking in our private, off road car park at an extra cost.